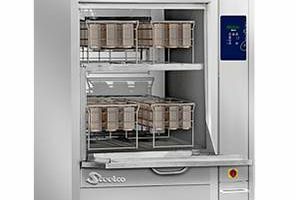 Steelco AC 1400 is an efficient system able to wash and disinfect all types of animal cages granting an easy maintenance of the cages cleanliness and effective cleaning results with the thermal/chemical destruction of micro-organisms by rinsing at 85°C through an independent rinsing circuit. Highest flexibility is granted by the compact design, which assures low cycle costs by reduced consumption of water and energy. 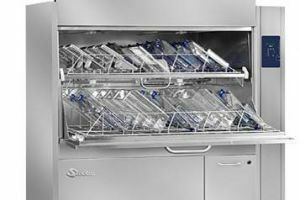 The washer can be equipped with dedicated accessories for the optimized loading of animal cages and washing carts with injection systems for bottles. An optional configuration allows the effective cleaning process of aquatic tanks fully compatible with cage plastic materials and without chemical residuals after the rinse phase. – Manual opening. The door is composed by two sections, the upper section opens with a sliding up movement, the lower one is hinged. – The lower section of the door, when open, acts as a loading platform for the loading tray allowing a convenient loading and unloading job. – Opening of the door during the washing cycle stops the execution granting the operator safety. – In the double door version, the doors are interlocked. – The lower loading tray slides on rollers and uses the door as a loading platform. – Upper loading tray slides on fully extendable telescopic bearing rails. 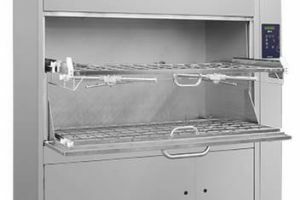 – Standard loading trays are suitable for the washing of cages. An accessory upper loading tray allows the injection washing and rinsing of the inner part of animal feeding bottles. 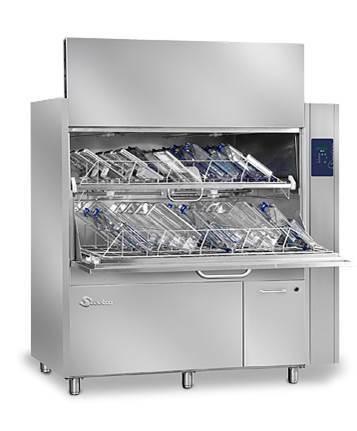 – The washing system operates with independent washing and rinsing hydraulic circuits. – Washing water is loaded in the washing chamber sump and heated up to the temperature defined for the washing water. – Rinsing water (demineralized) is loaded onto an AISI 316L pre heating tank placed under the washing chamber. Pre heating tank is equipped with 18 kW power electrical heating elements. – Temperatures in the sump and in the pre heating tank are checked by two PT1000 temperature probes. – Pump activity is controlled by pressure checks on both the washing and rinsing circuits. – The demineralized water at 85°C / 185°F used during the sanitizing phase dilutes the washing water solution. Helps in keeping the washing solution at the proper temperature allowing relevant savings in the energy and water consumption. – Two (2) water line connections for cold/mixed or demineralized water. – Water level sensor into the washing chamber. – First and second stage filters are easily accessible directly from the washing chamber. – Automatic self cleaning filter on the third stage. – AC 1400 is endowed with a stainless steel drawer for the storage of up to four (4) chemical tanks with 10t capacity. – Different programs can be programmed and selected directly from the control panel. – Constantly informs the operator regarding machine status, cycle phase, remaining cycle time to the end of treatment and the chamber temperature. – At the end it points out that the cycle has been correctly processed. – Audible and visual alarms provide quality control for each wash cycle. – The electronic control panel is installed on sliding rails, access for maintenance is simplified.